Only 210 examples of the LaFerrari Aperta were ever made, but we doubt many were finished in white. 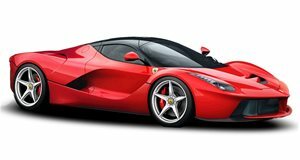 The LaFerrari is the fastest road car Ferrari has ever built to date, and was built in limited numbers which makes finding one for sale a daunting task. Only 500 examples of the hybrid hypercar rolled off the production line between 2013 and 2015, but Ferrari also made a convertible version which is even rarer. Since only 210 examples were made, the open-top LaFerrari Aperta often commands astronomical asking prices - the last one we saw for sale . While there’s no asking price for this particular LaFerrari Aperta currently listed for sale at Saudi Arabia-based dealer Seven Car Lounge, there’s a good chance this example has a similar price tag. Prices for the LaFerrari Aperta are thought to have been around $2 million when it was first revealed at the 2016 Paris Auto Show - at which point every model had already been sold. With only 62 miles on the odometer, this example is practically fresh out of the factory. Unlike most LaFerraris which left the factory with Ferrari’s signature Rosso Corsa red paint job, this open-top version is finished in white which makes it even rarer and could potentially increase its value. Like its fixed-roof sibling, the convertible hypercar is powered by a 6.2-liter hybrid V12 powertrain that sends a monumental 950 horsepower to the rear wheels through a seven-speed dual-clutch transmission. 0-62 mph takes less than three seconds, before the LaFerrari Aperta reaches a top speed of 217 mph. It remains to be seen if Ferrari builds a convertible version of the current 812 Superfast, but if the is anything to go by you can bet it will be built in extremely limited numbers. For now, then, this could be your best chance of owning a modern Ferrari convertible.